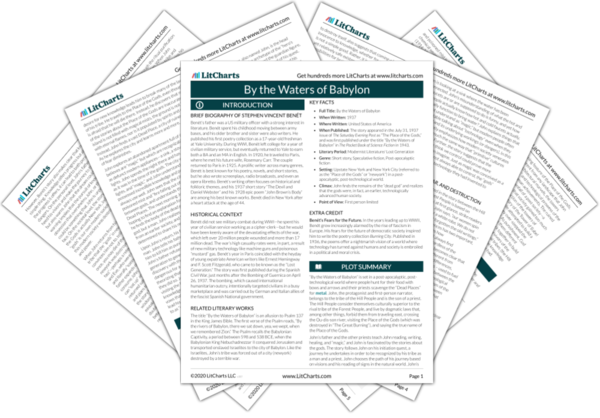 Instant downloads of all 946 LitChart PDFs (including By the Waters of Babylon). 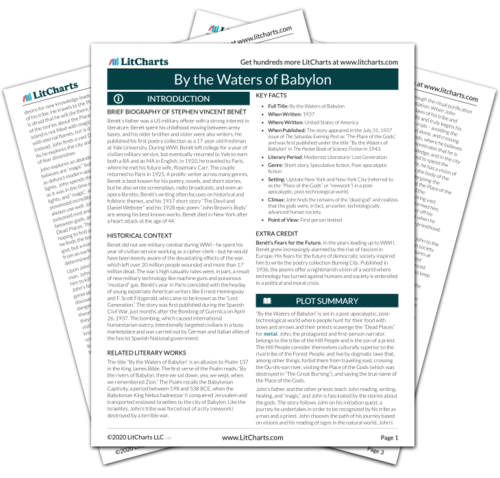 Welcome to the LitCharts study guide on Stephen Vincent Benét's By the Waters of Babylon. Created by the original team behind SparkNotes, LitCharts are the world's best literature guides. A concise biography of Stephen Vincent Benét plus historical and literary context for By the Waters of Babylon. A quick-reference summary: By the Waters of Babylon on a single page. In-depth summary and analysis of every of By the Waters of Babylon. Visual theme-tracking, too. Explanations, analysis, and visualizations of By the Waters of Babylon's themes. By the Waters of Babylon's important quotes, sortable by theme, character, or . Description, analysis, and timelines for By the Waters of Babylon's characters. Explanations of By the Waters of Babylon's symbols, and tracking of where they appear. An interactive data visualization of By the Waters of Babylon's plot and themes. Benét’s father was a US military officer with a strong interest in literature. Benét spent his childhood moving between army bases, and his older brother and sister were also writers. He published his first poetry collection as a 17-year-old freshman at Yale University. During WWI, Benét left college for a year of civilian military service, but eventually returned to Yale to earn both a BA and an MA in English. In 1920, he traveled to Paris, where he met his future wife, Rosemary Carr. The couple returned to Paris in 1925. A prolific writer across many genres, Benét is best known for his poetry, novels, and short stories, but he also wrote screenplays, radio broadcasts, and even an opera libretto. Benét’s writing often focuses on historical and folkloric themes, and his 1937 short story “The Devil and Daniel Webster” and his 1928 epic poem “John Brown’s Body” are among his best known works. Benét died in New York after a heart attack at the age of 44. 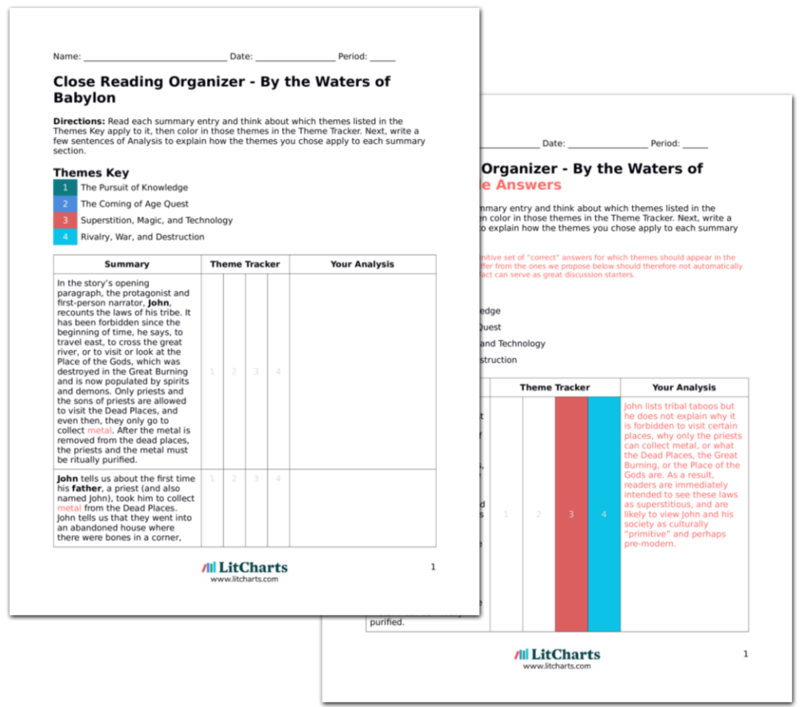 Get the entire Waters of Babylon LitChart as a printable PDF. Benét did not see military combat during WWI—he spent his year of civilian service working as a cipher-clerk—but he would have been keenly aware of the devastating effects of the war, which left over 20 million people wounded and more than 17 million dead. The war’s high casualty rates were, in part, a result of new military technology like machine guns and poisonous “mustard” gas. Benét’s year in Paris coincided with the heyday of young expatriate American writers like Ernest Hemingway and F. Scott Fitzgerald, who came to be known as the “Lost Generation.” The story was first published during the Spanish Civil War, just months after the Bombing of Guernica on April 26, 1937. The bombing, which caused international humanitarian outcry, intentionally targeted civilians in a busy marketplace and was carried out by German and Italian allies of the fascist Spanish National government. The title “By the Waters of Babylon” is an allusion to Psalm 137 in the King James Bible. The first verse of the Psalm reads, “By the rivers of Babylon, there we sat down, yea, we wept, when we remembered Zion.” The Psalm recalls the Babylonian Captivity, a period between 598 and 538 BCE, when the Babylonian King Nebuchadnezzar II conquered Jerusalem and transported enslaved Israelites to the city of Babylon. Like the Israelites, John’s tribe was forced out of a city (newyork) destroyed by a terrible war. When Published: The story appeared in the July 31, 1937 issue of The Saturday Evening Post as “The Place of the Gods,” and was first published under the title “By the Waters of Babylon” in The Pocket Book of Science Fiction in 1943. Setting: Upstate New York and New York City (referred to as the “Place of the Gods” or “newyork”) in a post-apocalyptic, post-technological world. Climax: John finds the remains of the “dead god” and realizes that the gods were, in fact, an earlier, technologically advanced human society. Benét’s Fears for the Future. In the years leading up to WWII, Benét grew increasingly alarmed by the rise of fascism in Europe. His fears for the future of democratic society inspired him to write the poetry collection Burning City. Published in 1936, the poems offer a nightmarish vision of a world where technology has turned against humans and society is embroiled in a political and moral crisis. Frisella, Emily. "By the Waters of Babylon." LitCharts. LitCharts LLC, 14 Dec 2016. Web. 24 Apr 2019. Frisella, Emily. "By the Waters of Babylon." LitCharts LLC, December 14, 2016. Retrieved April 24, 2019. https://www.litcharts.com/lit/by-the-waters-of-babylon.